No, I’m not talking about metaphorical lynchings either. I’m talking about Sandra Bland, hanged in jail by… well they say, by herself. I’m talking about the old fashioned black man hanging from a rope until he dies style of lynching. Odd that you haven’t heard much about it, eh? I mean, doesn’t there seem to be a sudden uptick in news coverage of the injustice experienced by “people of color”? It didn’t seem that way in my younger days. I can remember family members lamenting the lack of coverage of “black” deaths, especially by law enforcement. Now that cops are gunning our people down on national television, for some, it appears like the injustice is something brand new. Nope. Not new at all. Media, like most businesses, tend to do what is profitable. It wouldn’t take a whole lot of analysis to determine that more coverage of cops gunning down arguably innocent black men equals higher ratings in this political climate. No wonder Fox and Netflix offered record-breaking amounts to own the profits of the forthcoming Nat Turner drama. However, there is always a limit to how far they will go — whoever they are. That’s why we saw wall to wall coverage of Ferguson but almost no major media coverage of the latest Million Man March. We can speculate to no end about why or who but there is a conscious effort to spark profitable debate without tipping the scales to a revolution. Lynchings in America, if played up by the media in this “black power” atmosphere, would definitely put weight on the wrong side of the revolution balance. Imagine seeing a police officer kill a young boy in a way you think shows no regard for his life and is racially influenced then the next day seeing breaking news of another young man of the same ethnic background whose hanging was determined a suicide by the authorities. It’s all a part of the prophecy that the Most High pronounced against our people for the disobedience of our fathers (Zechariah 11:5). Suicide may make sense to anyone who isn’t familiar with the history of lynchings in America. Lynching was a perfectly legal way to punish a slave and to induce a fear that prevented slave rebellion. Even after slaves were made “free” in America, lynchings were used to publicly punish a behavior that was seen to be unseemly or unacceptable. You know serious crimes like saying the wrong things, talking back, or attempting to vote. And we’re not talking about 200 years ago… the so-called “last lynching,” as described by the Discovery channel, was only 35 years ago. Not to mention 19-year-old Keith Warren, who according to authorities, carried 40 feet of rope and a change of clothes in broad daylight to eventually hang himself a quarter mile from where his car was parked. Or what about 18-year-old Andre Jones, who authorities say hanged himself in jail with a shoe lace in 1996? The oppression and affliction continue (Genesis 15:13)… so when we see these darker skinned people accused of “suicide” by hanging in the same places that are notorious for lynchings, we tend to be skeptical (to say the least). Most lynchings occurred in the Deep South (i.e., Mississippi, Georgia, Louisiana, Alabama, and South Carolina). Border Southern states—Florida, Tennessee, Arkansas, Kentucky, and North Carolina also had a noteworthy number of lynchings. NAACP leaders questioned why Golden had little or no soil on his shoes after walking across a lawn on a rainy night, and how he was able to climb the tree with a blood-alcohol level of 0.334 percent. Cohen questioned the chief investigator about rumors that Golden had been lynched and was dating the police officer’s white daughter. Belle Glade Police Detective Steve Sawyers said investigators did not look into the rumors because they felt they had no validity, prompting questions from those watching the proceedings. 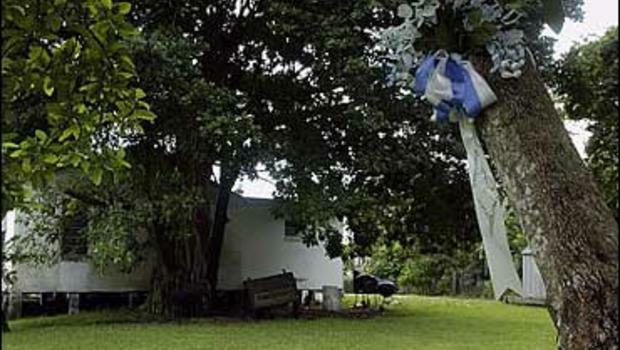 On the morning of October 13, 2004, a tree in the yard of a white family in Grantville, GA, bore strange fruit. That fruit was the body of Bernard C. Burden, who was found hanging with a noose around his neck. Bernard frequented this house as he socialized with a group of white people who hung out there. But on that dreadful morning, Chris Ward, who lived there, claims he found Bernard’s body hanging from a tree. He called the police, and they cut the body down from the tree and awaited the coroner’s arrival. The coroner, Wimp Pierce, arrived and immediately ruled it a suicide. Bernard’s mother, Tamathy Pless, was at her job when Police Chief Ramos finally told her the dreadful news. When she inquired about a criminal investigation, she was told that it was not necessary. Ramos told her that the coroner’s investigation was good enough for him. Since when are coroners qualified and authorized to investigate a crime scene?